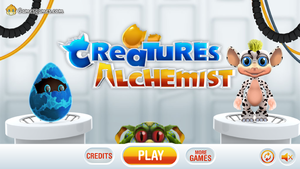 Creatures Alchemist is a free-to-play minigame created by Spil Games as a teaser for Creatures Family. Creatures Alchemist is available to play for free on Spil's flash websites. The player is an assistant to the Shee (a character using the Master Shee sprites) and combines different elements to make genes that can then be combined to discover different norn breeds. The gameplay of Creatures Alchemist has been compared to Doodle God, and the creatures, when found, wave at the player in a NPC-like manner. Clicking on the creature gives a screen which gives a little information about the breed. 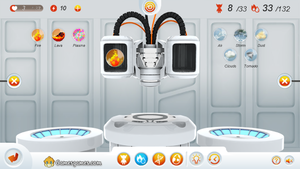 Certain elements of the game, such as the hatchery background and some of the norn breeds are taken from Creatures Online, which was cancelled in 2015. All the other breeds, such as the Alba Norns, are taken from other games in the series. There are five 'episodes' in the game, but only the first could be completed. 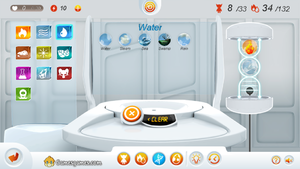 As of January 2018, it was reported that the game had been updated, introducing a bug that meant the game was unplayable after the tutorial. The screen where the player mixes elements. Newly-formed elements are often used in the next quest to create a norn breed. Elements will fall out of the gene machine automatically if they cannot be used to create a creature. Creating a Grendel comes with a penalty of 50 Energy. BUG? The next quest won't appear! Some element combinations lead to grendels being created, who are put underground. Creating grendels causes you to lose some energy; however if you do not have the energy required, no energy is lost. The Gene Combinator room, with two out of three elements loaded. There are 132 elemental combinations to discover. If the player creates a norn breed before the objective for creating it appears, the game won't register it as being complete, even if the player makes additional norns from that breed. The only way to resolve this issue is to restart the game. The "Watch Video" feature may not work for some players, making it impossible to get any more energy. When resetting your progress, the life bar for getting new lives displays NaN:NaN instead of a counter and lives don't increase. Refreshing solves this. For some reason finishing the second episode doesn't unlock the third. In episode 2, the genetic combination "Insect, Bird & Horse" will create a red and purple egg, but the egg won't show up in the hatchery. As of January 2018, it was reported that the button to go to the Gene Combinator room was removed from the interface, making the game unplayable. Shortly after its release, Creatures Alchemist was criticised by many community members due to its linear nature and the fact it has free-to-play elements, as well as simple visuals, numerous spelling mistakes, and long in-game waiting times. However, despite this, some members do enjoy the game. It is currently unknown if Creatures Alchemist is any reflection of Creatures Family, or if it will be a completely different game altogether. This page was last modified on 27 October 2018, at 18:03.